The Seal Impression Inker will add ink to an embossed impression making it suitable for photocopying. This is a must-have for notaries whose states require a photographically reproducible seal impression and can be used for corporate seals and any other embossed impressions. After embossing the page with an embossing seal, lightly press the inker on the raised impression to produce an inked image. The inker is great for faxing, scanning, or photocopying documents that have been sealed with an embosser. The inker can also come in handy for adding the signer's fingerprint to your record book entry! 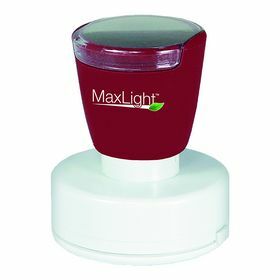 The Seal Impression Inker is a MaxLight 535 desk stamp, round with a handle, and pre-inked with black ink.